Here is a good news for N8 owners as the new firmware upgrade has resolved the popular and nasty MFE (Mail For Exchange) bug which affected synchronization with Microsoft Exchange Server 2010, SP 1 for a limited set of N8 users. With this firmware upgrade, you will also see an upgrade for Nokia Ovi Store and Ovi Maps (in case you have not upgraded these before on your own). The upgrade is not available for all the users at this time. 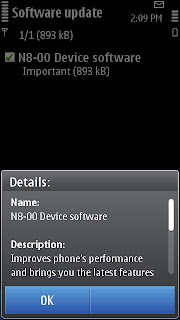 This firmware release has been pushed only to the countries which are using the unlocked version of the phone. Users who have their phone locked with network operators might have to wait a while but it is confirmed that they will get the upgrade too. As per Nokia PR1.2 fixes will also be available with PR 2.X release which means that if you are unable to get the fix, you will definitely get in the PR 2 release which is going to be a major firmware upgrade containing massive GUI changes for Symbian^3 OS. With more and more devices being released by Nokia with Symbian^3 OS, there are significant enhancements in store for the operating system. The year 2011 will see a new S^3 OS with redefined GUI and enhancements to further improve the customer satisfaction with the phone. 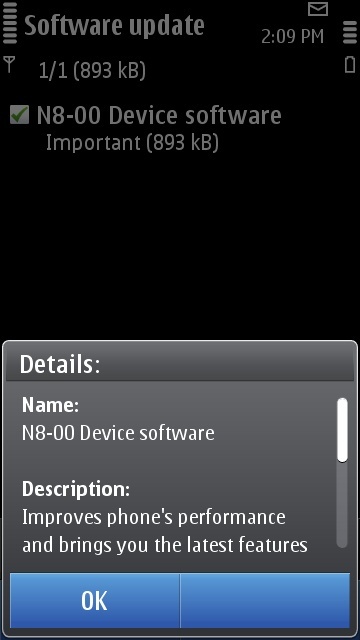 The firmware upgrade can be accessed by using Menu -> Applications -> SW update utility in the phone. The update size is approx. 1 MB in size. Make sure to backup your phone before upgrading to be on the safer side. 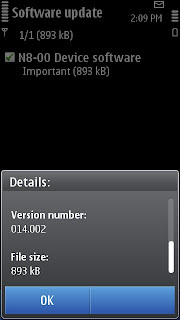 You can use the Nokia Ovi Suite for backup or the inbuilt device backup utility. This upgrade has indeed raised my hopes with S^3 OS.